I love when retailers use the word 'event.' It makes it seem more epic in scale. 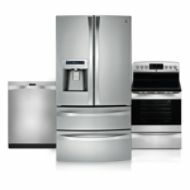 Sears is having a Summer Savings Event with big discounts on items throughout their entire store. I'm seeing deals up to 50% OFF, and that includes big-ticket items. Bonus: Depending on what you purchase Sears will also take an extra 5-15% OFF your order. Also, spend $59 or more for FREE shipping or just go pick up at the local store at no extra cost. Click here to see the sale at Sears.